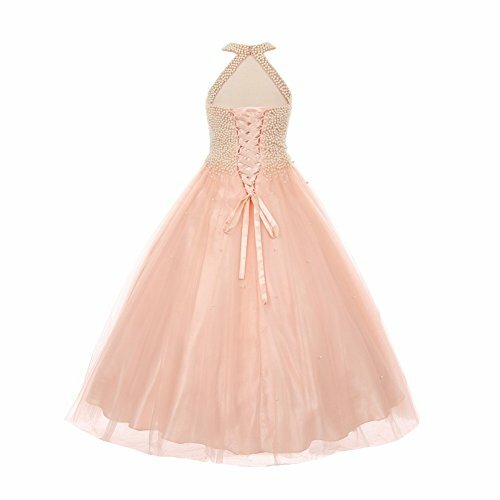 Big Girls Blush Dazzling Halter Neck Party Tulle Junior Bridesmaid Dress 12 | What Should I Say? A great pick for a festive event, this Cinderella Couture piece reflects elegance and style. This is a dazzling halter neck all over pearls party tulle dress in blush. Professionally crafted with all hand made pearl design. The best quality pearls for maximum shine. Yoke circle neck and spaghetti waist adjustable are features that contribute to a sophisticated and ladylike look. Great for all occasion and party that call for a festive attire.